At OpenWorld today, Oracle announced the release of Oracle Security Governor for Healthcare, a unique and comprehensive security governance solution that helps healthcare organizations with proactive detection and prevention of security and privacy breaches (click here for the press release). Oracle Security Governor becomes the second product we have in the identity governance space, taking its place alongside Oracle Identity Analytics in the Oracle IAM Suite. Oracle Security Governor for Healthcare is a governance solution that is aimed specifically at healthcare organizations, where the introductions of various regulations globally and the transformation of healthcare IT has created a number of challenges in the area of patient confidentiality that need to be addressed. Rapid Incident Detection: Criteria based automated reporting functionality that allows rapid incident detection, case management and investigations. Automated Privacy Audits: Allows audits on activities of various entities accessing the applications and reports suspicious activities. Accelerated Enterprise-wide Data Retrieval: Allows rapid integration with existing systems. Oracle Security Governor is built on some key products in Oracle’s portfolio, enhanced with some healthcare specific intelligence and artifacts. Oracle Security Governor for Healthcare leverages the Oracle SOA Suite Adapters (like Database, Log and HL7 adapters) to pull data in from virtually any data source into a central data warehouse. In-database data mining and predictive analytics built using Oracle Data Mining is used to detect anomalies and suspicious activity that may have taken place in the past. The solution also uses an advanced risk assessment engine (based on Oracle Adaptive Access Manager), which has been pre-loaded with healthcare specific risk and fraud rules to proactively detect incidents. 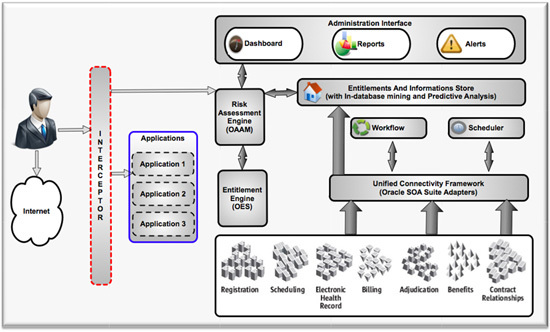 Oracle Entitlement Server provides unique risk-aware fine grained authorization on record and data access, cutting down the possibility of unauthorized activity and fraud. Finally, Oracle Business Intelligence Publisher is used to provide insight into all of this through risk analytics, reports and alerts. Historical Detection: that can be used as audit trails and for detection of suspicious activities related to access, privacy, fraud and security breaches, that have taken place in the past. Real Time Detection: Oracle Security Governor can also be used to detect suspicious and fraudulent activity, in the real time. Real Time Prevention: Oracle Security Governor can prevent suspicious activities, in the real time. The activities detected as anomalous or suspicious can either be completely blocked or the end-user can be alerted or required to meet additional security requirements, depending on the deployment needs. Oracle Security Governor for Healthcare is just the beginning. In the future, Oracle hopes to use the Oracle Security Governor framework to build more solutions that address challenges faced in other verticals besides healthcare. But that doesn’t mean you have to wait – you can leverage the products mentioned above to build your own security and privacy solutions. Just ask us how. You can find more information about Oracle Security Governor for Healthcare here on the product page. Future in the Clouds? How About Some ESSO-To-Go?